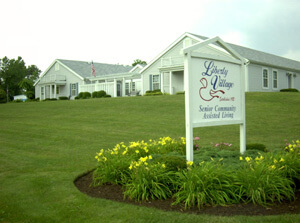 Liberty Village Assisted Living is proud to be the first assisted living community to serve the Chillicothe area. This single-story community consists of 40 private resident rooms. Liberty Village boasts abundant common area amenities, a beautiful interior courtyard as well as walking areas. You will experience and appreciate the comfortable, family atmosphere unlike any other assisted living community. Please contact us or call Sheila Blevins, Executive Director, at (740) 773-4630 (or option 3) to schedule a personal tour at your convenience. The community is location just west of Chillicothe on Route 50 (Western Avenue). The adjacent neighborhood is primarily single family homes. 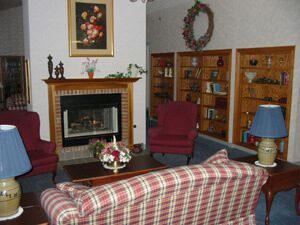 The Chillicothe Senior Center and numerous dining and shopping establishments are nearby. At Liberty Village, an Abbington Assisted Living Community, we value the independence of our residents. No one wants to feel like a burden to their family. It adds stress for everyone. At our assisted living communities, the residents don’t depend on their children for everything. Instead of worrying about eating habits, medication, and housekeeping, visits can be relaxing, happy. When residents have their family visit we want everyone to be stress free. That’s what assisted living is all about. Now life can be enjoyed. Liberty Village really feels like home. Fellow residents become friendly neighbors. Cozy fireplaces and parlors give character to the surroundings. And the private rooms have enough space for personal touches. It’s not a hotel or a hospital. The room becomes your own. Your pictures and decorations are encouraged. It’s not just a place to live, it’s home. Jennifer (Executive Director) responds promptly to any concerns or questions I've had regarding the facility and/or my dad. Her follow up or taking care of the concern or question can be counted on. Her warm and genuine personality along with her obvious concern for her residents is very evident. Not only does this apply to her residents, but their families as well. Although I live close, I'm not there to experience all the great care that I know my mom gets at Abbington. Heather has been such a blessing through the years. She has always been quick to shoot out an email to me when there is something I need to be aware of and I'm very appreciative about that. We have become friends over the years and discussed our family life so she makes me feel as though I'm part of her life and belong in the Abbington family. I appreciate the dedication of all of the staff but would especially like to recognize the nurse Amber, who thought that my mother should be seen in the ER and thus may have saved her life; Jennifer who rushed over late at night to oversee my mom's transfer to the emergency room and stayed until the wee hours of the morning until she knew she was being admitted to the hospital and not returning to the facility at that time; Brenda who plans such wonderful activities for the residents, and Brittany who is so always so cheerful and caring.